The Stockholm bedside table is perfectly proportioned. With a stylish twist combining two very different materials the Stockholm bedside table has a unique design. This bedside chest has a neat design, clean lines and solid shapes create a no fuss look. Two spacious, smooth running drawers give you ample space for your bedside essentials. The chunky surface top offers plenty of space for your necessities such as your alarm clock and lamp. Combining an unusual mix of materials the Stockholm bedside table has a unique design. 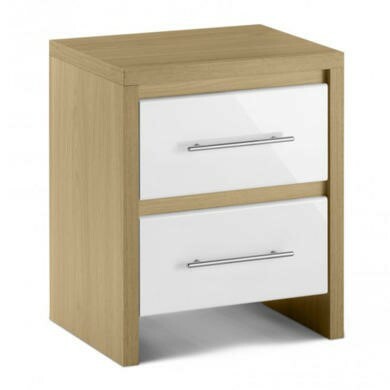 The sleek, bright, white, high gloss drawer fronts bring a highly contemporary look to the bedside table whilst the light oak carcase is fresh and neutral, bringing a homely touch to the piece. A strong wood combination makes up the carcase which is then finished with a durable light oak veneer. The drawer fronts are finished with a sleek, bright white, high gloss lacquer to give them that desirable shine. As this bedside table has elements of high gloss we would recommend a hint of polish now and again to bring out the natural shine of the Stockholm. The rest of the item can be maintained with a simple wipe over with a dry cloth or duster. The Stockholm bedside table is delivered flat packed so self-assembly is required. Step by step instructions are of course included and as this is a smaller item it shouldn’t take you too long to build. You’ll be enjoying the Stockholm at your bedside in no item!